This is pertinent because on our recent summer vacation, we were on a tight budget, and wanted to save dining dollars. We recalled these road-trip experiences and decided we would picnic on the way to the farm. Before leaving home, we packed up sandwiches and Pepperidge Farm cookies, and put some sodas and water in a cooler. We chose our Southernmost route to the farm because at about the half-way mark we cross Buggs Island Lake, and typically stop in Clarksville, VA. This time we planned to stop and make Occoneechee State Park our picnic spot. It is a Virginia State Park on the shore of Buggs Island Lake, also known as the Kerr Reservoir. About the time we started getting hungry, we saw the sign for the park! We paid a few dollars to park, drove to the recommended picnic spot and found a shady parking place. Picnicking at the Occoneechee State Park on the way to the farm. 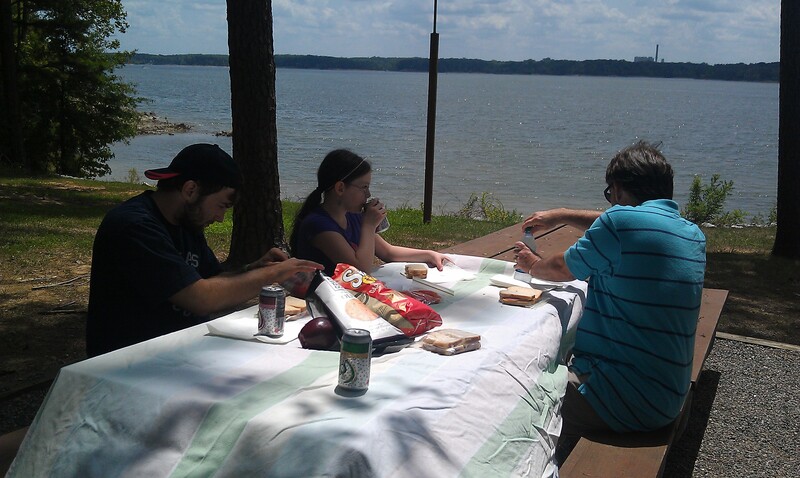 The kids picked out a table overlooking the lake, laid out the table cloth, and unpacked the picnic bag. A nice breeze kept the bugs away, and we enjoyed a delightful lunch watching boats speed by in the lake. Soon the kids were involved in a game of Frisbee in the big green field by the Park Office (yes, I threw it a few times too!). We also had time to stop in the Park Office where there are bathrooms and a small gift/camp store. The Park Office hosts a small but informative museum about the Occoneechee Indians, so we took a few minutes to learn about this peaceful tribe who once ran a profitable fur trade in the region. After our picnic lunch, light exercise and pleasant visit we got back on the road refreshed and feeling like our vacation had really started! After this successful venture, Papa Gene volunteered to pack up sandwiches for our next long drive a few days later down to Asheville, NC. Papa Gene did a GREAT job making our sandwiches! He even labelled our baggies and packed the fresh tasty tomato (from Mickey and Wanda’s garden) separately. 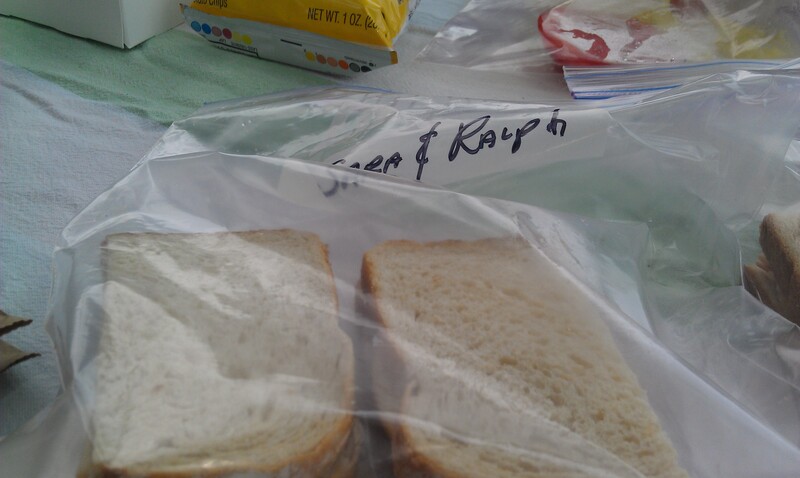 Papa Gene made our sandwiches! Thanks Papa Gene! This time we stopped, along with a very nice group of motorcyclists, at the Northwest Trading Post on the Blue Ridge Parkway NC Milepost 259 in Glendale Springs, NC. The Trading Post has a lovely rustic appearance, and sells a vast assortment of pottery and hand crafts, in addition to local honey, preserves, snacks and candy. We had packed drinks, but no dessert, so we bought some delicious fudge to finish off our meal. Again, we noticed how refreshed we felt after stopping, getting out of the car, stretching our legs, picnicking in the fresh air, and eating healthier food. We calculated that even with our few expenditures we definitely saved money by packing lunch. But what we really gained in each case was a fun family adventure that made our long distance driving seem not so far, and not so long! We all agreed that we would make roadside picnics a regular feature of our future travel plans! Do you like to picnic on long car rides? What types of food do you pack?